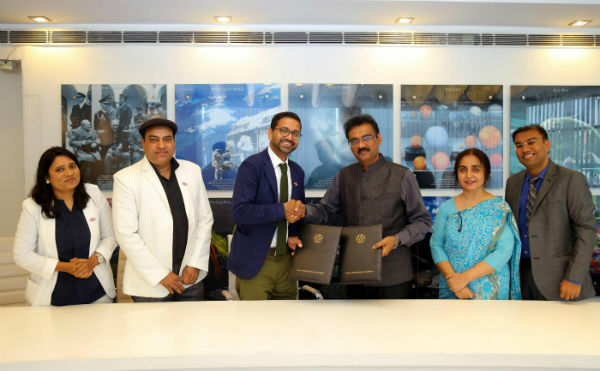 Jalandhar: Arkansas State University (A-State) of the USA and Lovely Professional University (LPU) have signed a Memorandum of Understanding at LPU Campus. With this MoU, LPU and A-State will work together in the areas of Hotel Management, Engineering, Business Management and more for exchange programmes. Under this MoU, LPU students visiting A-State University will not have to pay fees for the studies there for the stipulated semesters. Similarly, under same notion, A-State students will also be able to receive education without any fees at LPU campus. For this important collaboration between top American and Indian universities, LPU Chancellor Mr Ashok Mittal, Registrar Dr Monica Gulati and Director (Division of International Affairs) Mr Aman Mittal welcomed 3-member A-State delegation, led by Executive Director of Global Initiatives at A-State Dr Thilla Sivakumaran. Being highly impressed by the infrastructure and academic pursuits going on at LPU campus, delegates from A-State were all praise for LPU endeavours. They affirmed that ties between LPU and A-State will stand fast for a long-run for the mutual benefit of the students of both the countries. They also appreciated the way LPU students are being provided world class education in almost all the fields. Founded in 1909, A-State university is a public institution with a ‘City setting’ on a campus of 1,300+ acres. It has the best ranking in the 2018 edition of best colleges in Regional Universities. As an active research institution, ASU is engaged with technology transfer – collaborating with technology firms, the energy industry and other partners. It also produces forth fundamental research in social and natural sciences.